The present disclosure relates to active matrix arrays and elements thereof. In a particular aspect, the present disclosure relates to digital microfluidics, and more specifically to Electrowetting on Dielectric (EWOD) devices such as Active Matrix Electrowetting on Dielectric (AM-EWOD) devices. The disclosure further relates to fluids that enable low-voltage operation of such devices. Electrowetting on Dielectric (EWOD) is a technique for manipulating droplets of fluid by application of an electric field. It is thus a candidate technology for digital microfluidics for lab-on-a-chip technology. An introduction to the basic principles of this technology can be found in "Digital microfluidics: is a true lab-on-a-chip possible?" R.B. Fair, Microfluid Nanofluid (2007) 3:245-281. Figure 1 shows a part of a conventional EWOD device in cross section. The device includes a lower substrate 12, the uppermost layer of which is formed from a conductive material which is patterned so that a plurality of electrodes 10 (e.g., 10A and 10B in Figure 1) are realized. The electrodes of a given array element may be termed the element electrode 10. The liquid droplet 1, including a polar material (which is commonly also aqueous and/or ionic), is constrained in a plane between the lower substrate 12 and a top substrate 9. A suitable gap between the two substrates may be realized by means of a spacer 7 and a filler fluid 8 may be used to occupy the volume not occupied by the liquid droplet 1. The filler fluid 8 is typically non-polar and immiscible, or substantially immiscible with the liquid droplet 1 being manipulated. An insulator layer 5 disposed upon the lower substrate 12 separates the conductive element electrodes 10A and 10B from a first hydrophobic coating 3 upon which the liquid droplet 1 sits with a contact angle 2 represented by θ. The first hydrophobic coating 3 is formed from a hydrophobic material (commonly, but not necessarily, a fluoropolymer). On the top substrate 9 is a second hydrophobic coating 4 with which the liquid droplet 1 may come into contact. The second hydrophobic coating 4 is formed from a hydrophobic material (commonly, but not necessarily, a fluoropolymer). Interposed between the top substrate 9 and the second hydrophobic coating 4 is a reference electrode 6. In operation, voltages termed the EW drive voltages (e.g. VT, V0 and V00 in Figure 1) may be externally applied to different electrodes (e.g. element electrodes 6, 10A and 10B, respectively). The resulting electrical forces that are set up effectively control the hydrophobicity of the hydrophobic coating 3. By arranging for different EW drive voltages (e.g. V0 and V00) to be applied to different element electrodes (e.g. 10A and 10B), the liquid droplet 1 may be moved in the lateral plane between the two substrates 9 and 12. Active Matrix EWOD (AM-EWOD) refers to implementation of EWOD in an active matrix array incorporating transistors, for example by using thin film transistors (TFTs). United States Patent No. US6565727 (Shenderov, issued May 20, 2003) discloses a passive matrix EWOD device for moving droplets through an array. United States Patent No. US6565727 further discloses methods for other droplet operations including the splitting and merging of droplets, and the mixing together of droplets of different materials. United States Patent No. US6911132 (Pamula et al., issued June 28, 2005 ) discloses a two dimensional EWOD array to control the position and movement of droplets in two dimensions. United States Patent No. US7163612 (Sterling et al., issued Jan. 16, 2007 ) describes how TFT based thin film electronics may be used to control the addressing of voltage pulses to an EWOD array by using circuit arrangements very similar to those employed in AM display technologies. The approach of US7163612 may be termed "Active Matrix Electrowetting on Dielectric" (AM-EWOD). European Patent Application No. EP2404675 (Hadwen et al., published January 11, 2012 ) describes array element circuits for an AM-EWOD device. The addition of a surfactant is known to greatly enhance the electrowetting effect as described by O. Raccurt et. al. (J. Micromech. Microeng. 17 (2007) 2217-2223). United States Patent No. US 8481125 (Yi et al., issued July 9, 2013 ) describes how certain lipophilic polymers can be used to reduce biofouling in electrowetting devices. Biofouling is a process where chemicals or bio molecules adhere undesirably to a surface. The use of surfactants which are soluble in the filler fluid of an electrowetting system is described by L. S. Roach et al. (Analytical Chemistry, 2005, 77(3), 785-796). United States Patent No. US 8980198 (Srinivasan et al., issued March 17, 2015 ) lists some possible surfactants that are soluble in the filler fluid and may be used in electrowetting devices. In the above aspects the filler fluid may comprise one or more oils, for example it may comprise one or more hydrocarbon oils, and/or one or more silicone oils. The filler fluid may further contain other additives, including a surfactant (specifically a siloxane-containing surfactant as defined above). For the avoidance of doubt, as used herein a "Silicone oil" is an oil with a [-Si-O-Si-O] backbone. An "oil" is any neutral, nonpolar chemical substance which is liquid at ambient temperature. In some embodiments, the surfactant is provided at a concentration ranging from about 0.001 to about 10% w/w in the liquid droplet or the filler fluid. In some embodiments, the filler fluid includes a silicone oil. In some embodiments, the filler fluid includes a hydrocarbon oil. In some embodiments, the surfactant has no overall charge. In some embodiments, the surfactant is anionic or cationic. In some embodiments, the surfactant further includes a polyol. In some embodiments, the surfactant further includes polyethylene glycol. In some embodiments, the surfactant further includes polyoxyethylene glycol (-(CH2CH2-O-)n) where n≥1. In some embodiments, the surfactant further includes polyoxypropylene glycol (-(CH2CHCH3-O-)n) where n≥1. In some embodiments, the surfactant further includes a hydrocarbon chain (CH2)n where n≥1. wherein a ≥ 1, b ≥ 1, c ≥ 1, and d ≥ 1; and R= -H or -CH3. wherein a ≥ 1, b ≥ 1, c ≥ 1, d ≥ 1, and e ≥ 1; and R= -H or -CH3. wherein a ≥ 1 and b ≥ 1; and R= -H or -CH3. wherein a ≥ 1, b ≥ 1, and c ≥ 1; and R is H-, CH3-, CH3CH2-, Phenyl- (H5C6-), Benzyl- (H5C6CH2-), Tolyl- (CH3H5C6-), a partially or fully fluorinated alkyl or other suitable group. where a≥1, b≥1 and c≥1; and R is H-, CH3-, CH3CH2-, Phenyl- (H5C6-), Benzyl-(H5C6CH2-), Tolyl- (CH3H5C6-), a partially or fully fluorinated alkyl or other suitable group. wherein a ≥ 1, b ≥ 1, c ≥ 1, d ≥ 1, e ≥ 1, and f ≥ 1; and R= -H or -CH3. where a≥1, b≥1, c≥1, d≥1, e≥, and f≥1; and R is H-, CH3-, CH3CH2-, Phenyl-(H5C6-), Benzyl- (H5C6CH2-), Tolyl- (CH3H5C6-), a partially or fully fluorinated alkyl or other suitable group. where a≥1, b≥1, c≥1, d≥1, e≥, f≥1 and g≥1; and R is H-, CH3-, CH3CH2-, Phenyl-(H5C6-), Benzyl- (H5C6CH2-), Tolyl- (CH3H5C6-), a partially or fully fluorinated alkyl or other suitable group. wherein a ≥ 1, b ≥ 1, c ≥ 1, d ≥ 1, e ≥ 1, f ≥ 1, and g ≥ 1; and R= -H or -CH3. In preferred embodiments e=14 and f/g =10. In some embodiments, the liquid droplet contains the surfactant and the surfactant is soluble in the liquid droplet. wherein the surfactant is provided at a concentration ranging from about 0.001 to about 10% w/w in the filler fluid. In some embodiments, the one or more oils include a silicone oil. In some embodiments, the filler fluid additionally or alternatively includes a hydrocarbon oil. In some embodiments, the surfactant is represented by one of the structural formulae (B) and (E) to (R) set out below. Another aspect of the present invention provides a use of a composition as defined above, the use comprising using the composition as a filler fluid in an electrowetting on dielectric device. The use may comprise: introducing the composition and one or more liquid droplets into an interior volume of an electrowetting on dielectric device comprising: (a) a first substrate comprising electrodes at a surface of the first substrate configured to effect electrowetting mediated droplet operations; and (b) a second substrate spaced from the surface of the first substrate to define the interior volume between the first substrate and the second substrate. the use comprising: providing the surfactant in one or both of a liquid droplet and a filler fluid, and introducing the liquid droplet and the filler fluid into an interior volume of an electrowetting on dielectric device comprising: (a) a first substrate comprising electrodes at a surface of the first substrate configured to effect electrowetting mediated droplet operations; and (b) a second substrate spaced from the surface of the first substrate to define the interior volume between the first substrate and the second substrate. The use may comprise providing the surfactant at a concentration ranging from about 0.001 to about 10% w/w in the filler fluid or the liquid droplet..
Any feature described with reference to one aspect or embodiment of the invention may be incorporated in any other aspect or embodiment described herein. Figure 1 shows a schematic diagram depicting a conventional EWOD device in cross-section. Figure 2 is a schematic diagram depicting an AM-EWOD device in perspective in accordance with a first and exemplary embodiment of the present disclosure. Figure 3 shows a cross section through some of the array elements of the exemplary AM-EWOD device of Figure 2. Figure 4 shows the electrowetting curve of a conventional aqueous surfactant (tween 20) compared to the surfactants containing a siloxane group (silicone surfactant) in accordance with the present disclosure. Figure 2 is a schematic diagram depicting an AM-EWOD device in accordance with a first and exemplary embodiment of the present disclosure. In the description that follows, the features of the present disclosure are described primarily in the context of an AM-EWOD device. It will, however, be understood that the features of the present disclosure are equally applicable, for example, to other EWOD devices in general. 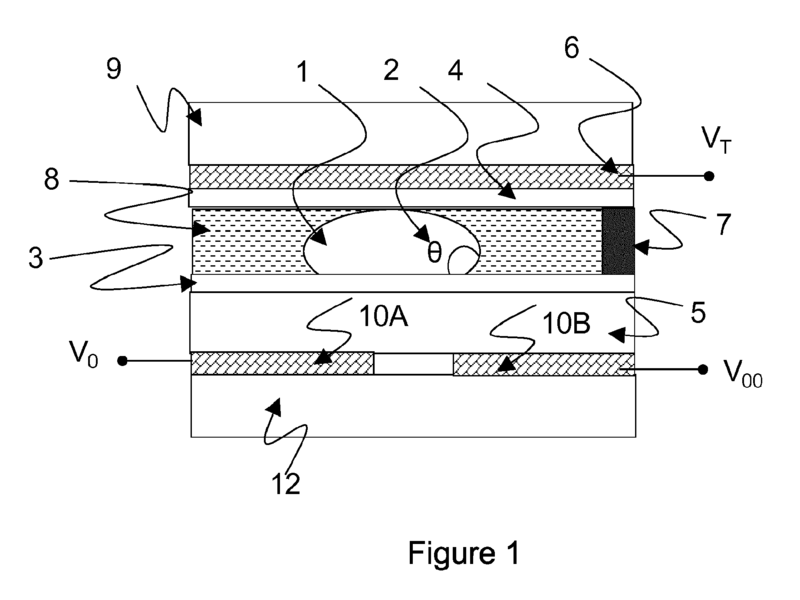 The AM-EWOD device shown in Figure 2 has a lower substrate 12 with thin film electronics 13 disposed upon the lower substrate 12. The thin film electronics 13 are arranged to drive the array element electrodes 10. A plurality of array element electrodes 10 are arranged in an electrode array 11, having X by Y elements where X and Y may be any integer. A liquid droplet 1, which may include any polar liquid and which typically may be ionic and/or aqueous, is enclosed between the lower substrate 12 and a top substrate 9. It will be appreciated that in some embodiments, multiple liquid droplets 1 can be present. A suitable gap between the two substrates may be realized by means of a spacer 7, and a filler fluid 8 may also be provided in the gap between the two substrates. The filler fluid 8 may be, for example, an alkane, a silicone oil or other non-polar liquid. The filler fluid 8 may contain a surfactant. In some embodiments, the surfactant (e.g., contained within the filler fluid 8) may contain a siloxane functional group represented by the following structural formula A. High solubility in oils for use in EWOD devices, e.g. silicone oils. Facilitating a reduction of biofouling of hydrophobic surfaces. Compatibility with (bio)chemical transformation occurring in the liquid droplet. Low surface energy associated with the interface between the filler fluid and the polar liquid being manipulated. This facilitates droplet manipulation at lower electrowetting voltages than is possible for conventional surfactants. This feature may be particularly advantageous for AM-EWOD devices where there is a desire to minimize electrowetting voltage in accordance with the capabilities of the TFTs. Compatibility with other surfactants present in the polar droplets. In exemplary embodiments the filler fluid of the present disclosure may be used in conjunction with additional surfactants added to the polar (e.g. aqueous droplets). In such embodiments there may be additional advantages compared to using just a single surfactant or surfactants within just one of the phases. These advantages may enable AM-EWOD devices to perform a wide range of commercially relevant (bio)chemical transformations which would have otherwise been elusive. Figure 3 is a schematic diagram depicting an exemplary pair of the array elements 10A and 10B in cross section that may be utilized in the AM-EWOD device of Figure 2. The device configuration of Figures 3 bears similarities to the conventional configuration shown in Figure 1, with the AM-EWOD device of Figure 3 further incorporating the thin-film electronics 13 disposed on the lower substrate 12. The uppermost layer of the lower substrate 12 (which may be considered a part of the thin film electronics layer 13) is patterned so that a plurality of the array element electrodes 10 (e.g., 10A and 10B in Figure 3) are realized. These may be termed the array element electrodes 10. The term "array element electrode" in the following description may refer to the electrode 10 associated with a particular array element, and also to the node of an electrical circuit directly connected to this element electrode 10. The reference electrode 4 is also disposed upon the top substrate 9 to realize an in-plane reference electrode geometry. Generally, an exemplary AM-EWOD device that includes thin film electronics 13 is configured as follows. The AM-EWOD device includes a reference electrode 6 (e.g., an in-plane reference electrode 6) and a plurality of array elements, each array element including an array element electrode (e.g., array element electrodes 10). Relatedly, the AM-EWOD device may be configured to perform a method of controlling an electrowetting voltage to be applied to a plurality of array 11 elements. The AM-EWOD may include reference electrode 6 and a plurality of array elements, each array element including an array element electrode 10. The electrowetting voltage at each array element may be defined by a potential difference between the array element electrode 10 and the reference electrode 6. The method of controlling the electrowetting voltage includes the steps of writing a voltage to at least a portion of the array element electrodes 10, and supplying a voltage signal to the reference electrode 6. Moving droplets (from one array element to another). Mixing droplets together (by merging and agitation). Splitting droplets (e.g., into two halved droplets). Dispensing of a small droplet from a large reservoir droplet. Inputting droplets onto the array from large input reservoirs, which may interface the device with the outside world. In order for the AM-EWOD device to carry out this range of operations, a large change in contact angle should be able to result from a small electrowetting voltage. For this reason, it may be preferable and advantageous to use a surfactant within the system to lower the surface tension and reduce the electrowetting voltage. In AM-EWOD devices it may be particularly desirable and advantageous to reduce the electrowetting voltage in order to facilitate droplet manipulation at electrowetting voltages that are compatible with the maximum ratings of standard TFT devices (e.g., fabricated by standard Liquid Crystal Display manufacturing process). Possible technologies for fabricating the TFT backplane may include polysilicon TFT, oxide TFT (e.g. Indium Gallium Zinc Oxide TFT), amorphous silicon TFTs or organic TFTs. It may also be advantageous to minimize the electrowetting voltage in order to reduce the power consumed by the TFT circuitry. Furthermore, it may be advantageous to minimize the electrowetting voltage to reduce the electric field through the insulator and hydrophobic coating layers included as part of the AM-EWOD device. This may improve device reliability and manufacturing. Use of an oil (compared to air) may lower the surface tension and therefore the voltage required to perform droplet manipulation operations. Use of an oil may prevent evaporation of the liquid droplet. Use of an oil may assist in preventing bio-fouling. Stability over the range of temperatures required by the application. Bio-compatibility, so as not to adversely influence the chemistry of the polar liquid droplet. Low toxicity - to enable uptake in a wide application space. Low viscosity - to enable rapid droplet movement. Low volatility - to prevent evaporation during operation. Compatibility with bio(chemical) processes - to enable a wide range of bio(chemistries). wherein n≥1 and R is H-, CH3-, CH3CH2-, Phenyl- (H5C6-), Benzyl- (H5C6CH2-), Tolyl- (CH3H5C6-), a partially or fully fluorinated alkyl or another suitable functional group. The silicone oil may also have a cyclic structure as in for example decamethylcyclopentasiloxane. Silicone oils may be used as lubricants and hydraulic fluids due to being non-flammable unlike their carbon analogues. In addition, silicone oils are excellent electrical insulators, have good temperature stability and have good heat-transfer characteristics. The AM-EWOD devices in accordance with the present disclosure may be operated with a surfactant included in either the oil or the liquid droplet. The use of a surfactant may lower the surface tension and may facilitate droplet operations at low voltage. A surfactant added to the filler fluid may be less likely to interfere with any chemistry or bio-chemistry occurring within the liquid droplet. A surfactant added to the filler fluid may help to prevent bio-fouling of the surface of the hydrophobic coating. In some embodiments, the filler fluid may contain the surfactant at a concentration ranging from about 0.001 to about 15% w/w. In other embodiments, the filler fluid may contain the surfactant at a concentration ranging from about 0.001 to about 10% w/w. In other embodiments, the filler fluid may contain the surfactant at a concentration ranging from about 0.001 to about 5% w/w. There are a large number of possible surfactant chemical structures that may include the siloxane unit as described above in connection with structural formulas A and B. Surfactant structures include a hydrophobe (hydrophobic group) coupled to a polar (hydrophilic) functional group. It is the coupling of the hydrophobic and hydrophilic groups that give the surfactant structure its distinctive properties, for example lowering surface tension. In accordance with the present disclosure, the siloxane unit is used to form the hydrophobe of the surfactant structure. There are many possible polar (hydrophilic) groups which may be coupled to the siloxane unit to create a surfactant. In some embodiments, the hydrophilic group may be a polyol. One example of a hydrophilic group is a polyethylene glycol. In other embodiments, the hydrophilic group may be a polyoxyethylene glycol (-(CH2CH2-O-)n) where n≥1, a polyoxypropylene glycol (-(CH2CHCH3-O-)n) where n≥1, or may contain sugars or their derivatives. In some embodiments, one or more hydrocarbon chains (CH2)n (where n≥1) may be incorporated with the hydrophobe to further increase the hydrophobicity of the hydrophobe. The hydrocarbon chain may be a straight chain, branched or contain cyclic units, and may contain aromatic and other unsaturated sub units. The hydrophobic group may contain some polar groups such as (-OH, =NH, =C=O, -CO2H, -CN, -C-O-C-, -C-NH-C) while still being hydrophobic overall. The hydrocarbon chain may, in some embodiments, connect the hydrophobe with the hydrophilic group. In some embodiments, the surfactant may include one or more functional groups with a positive charge such as quaternary amines (-N+R3), phosphonium salts (-PR3 +) and sulfonium salts (-SR2 +); R is H-, CH3-, CH3CH2-, Phenyl- (H5C6-), Benzyl- (H5C6CH2-), Tolyl- (CH3H5C6-), a partially or fully fluorinated alkyl or other suitable group. In some embodiments, the surfactant may include one or more functional groups with a negative charge such as sulfates (-OSO3 -), sulfonates (-SO3 -), phosphates (-OPO3 2-) and carboxylates (-CO2 -). Such surfactants may have no overall charge, and in such instances may be referred to as zwitterionic surfactants. These charged groups can be incorporated into the surfactant via direct connection to the siloxane backbone or via a connecting chain such as an alkyl chain or glycol chain. In some embodiments, the surfactant has no overall charge. In other embodiments, the surfactant is anionic. In other embodiments, the surfactant is cationic. The following description sets forth several exemplary surfactants containing siloxane unit(s) in accordance with the present disclosure. The structures of the surfactants containing siloxane unit(s) described below are exemplary and should not be understood to be limiting the scope of the present disclosure. 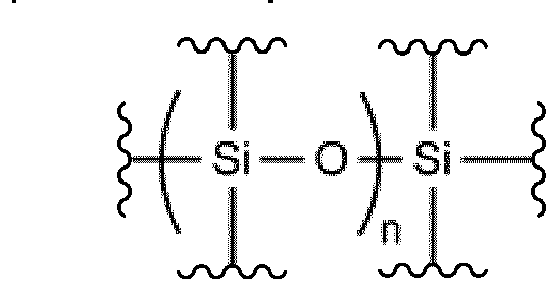 One exemplary class of surfactants containing siloxane unit(s) combines the siloxane group (e.g., dimethylsiloxane) with a polyol, an example of which is represented by the following structural formula (E). where a≥1, b≥1, c≥1 and d≥1; and R is H-, CH3-, CH3CH2-, Phenyl- (H5C6-), Benzyl- (H5C6CH2-), Tolyl- (CH3H5C6-), a partially or fully fluorinated alkyl or other suitable group. The values of a, b, c and d can be varied to change the total hydrophobicity of the surfactant. For example, increasing a and c may increase the hydrophobicity of the surfactant containing the siloxane unit(s) shown in structural formula (E). Increasing b and d may reduce the hydrophobicity of the surfactant containing the siloxane unit(s) shown in structural formula (E). where a≥1, b≥1, c≥1, and d≥1; and R is H-, CH3-, CH3CH2-, Phenyl- (H5C6-), Benzyl- (H5C6CH2-), Tolyl- (CH3H5C6-), a partially or fully fluorinated alkyl or other suitable group. In structural formula (F), the values of a, b, c, and d can be varied to change the total hydrophobicity of the surfactant. For example, increasing a and c may increase the hydrophobicity of the surfactant containing the siloxane unit(s) shown in structural formula (F). Increasing b, and d may reduce the hydrophobicity of the surfactant containing the siloxane unit(s) shown in structural formula (F). where a≥1, b≥1, c≥1 d≥1 and e≥1; and R is H-, CH3-, CH3CH2-, Phenyl- (H5C6-), Benzyl- (H5C6CH2-), Tolyl- (CH3H5C6-), a partially or fully fluorinated alkyl or other suitable group. In structural formula (G), the values of a, b, c, d and e can be varied to change the total hydrophobicity of the surfactant. For example, increasing a and c may increase the hydrophobicity of the surfactant containing the siloxane unit(s) shown in structural formula (G). Increasing b, d and e may reduce the hydrophobicity of the surfactant containing the siloxane unit(s) shown in structural formula (G). The values of a, b and c can be varied to change the total hydrophobicity of the surfactant. For example, increasing a and b may increase the hydrophobicity of the surfactant containing the siloxane unit(s) shown in structural formula (H). Increasing c may reduce the hydrophobicity of the surfactant containing the siloxane unit(s) shown in structural formula (H). In structural formula (I) the values of a, b and c can be varied to change the total hydrophobicity of the surfactant. For example, increasing a and b may increase the hydrophobicity of the surfactant containing the siloxane unit(s) shown in structural formula (I). Increasing c may reduce the hydrophobicity of the surfactant containing the siloxane unit(s) shown in structural formula (I). Another exemplary class of surfactants containing siloxane unit(s) may include a hydrocarbon chain (e.g., a lipophilic chain) to increase its solubility in the filler fluid, examples of which is represented by the following structural formulae (J and K). The structural formulae (J and K) combine the siloxane group with a polyol, wherein a hydroxyl terminated group is included on the hydrophilic tale. The values of a, b, c, d, e, f and g can be varied to change the total hydrophobicity of the surfactant. For example, increasing a, b, d and e may increase the hydrophobicity of the surfactant containing the siloxane unit(s) shown in structural formula (J). Increasing c and f may reduce the hydrophobicity of the surfactant containing the siloxane unit(s) shown in structural formula (J). Increasing a, b, d and e may increase the hydrophobicity of the surfactant containing the siloxane unit(s) shown in structural formula (K). Increasing c, f and g may reduce the hydrophobicity of the surfactant containing the siloxane unit(s) shown in structural formula (K). where a≥1, b≥1, c≥ and d≥1. where a≥1, b≥1, c≥1, d≥1, e≥1 and f≥1. where a≥1, and b≥1; and R is H-, CH3-, CH3CH2-, Phenyl- (H5C6-), Benzyl-(H5C6CH2-), Tolyl- (CH3H5C6-), a partially or fully fluorinated alkyl or other suitable group. where a≥1, and b≥1; and R is H-, and preferably where e=14 and f/g =8. In structural formula (L) the values of a and b can be varied to change the total hydrophobicity of the surfactant. For example, increasing a may increase the hydrophobicity of the surfactant containing the siloxane unit(s) shown in structural formula (L). Increasing b may reduce the hydrophobicity of the surfactant containing the siloxane unit(s) shown in structural formula (L). In structural formula (M) the values of a and b can be varied to change the total hydrophobicity of the surfactant. For example, increasing a may increase the hydrophobicity of the surfactant containing the siloxane unit(s) shown in structural formula (M). Increasing b may reduce the hydrophobicity of the surfactant containing the siloxane unit(s) shown in structural formula (M). In structural formula (N) the values of a, b, c and d can be varied to change the total hydrophobicity of the surfactant. For example, increasing a, b and d may increase the hydrophobicity of the surfactant containing the siloxane unit(s) shown in structural formula (N). Increasing c may reduce the hydrophobicity of the surfactant containing the siloxane unit(s) shown in structural formula (N). In structural formula (O) the values of a, b, c, d e and f can be varied to change the total hydrophobicity of the surfactant. For example, increasing a, b and d may increase the hydrophobicity of the surfactant containing the siloxane unit(s) shown in structural formula (O). Increasing c, e and f may reduce the hydrophobicity of the surfactant containing the siloxane unit(s) shown in structural formula (O). In structural formula (P) the values of a and b can be varied to change the total hydrophobicity of the surfactant. For example, increasing a may increase the hydrophobicity of the surfactant containing the siloxane unit(s) shown in structural formula (P). Increasing b may reduce the hydrophobicity of the surfactant containing the siloxane unit(s) shown in structural formula (P). In structural formula (Q) the values of a and b can be varied to change the total hydrophobicity of the surfactant. For example, increasing a may increase the hydrophobicity of the surfactant containing the siloxane unit(s) shown in structural formula (Q). Increasing b may reduce the hydrophobicity of the surfactant containing the siloxane unit(s) shown in structural formula (Q). In structural formula (R) the values of a and b can be varied to change the total hydrophobicity of the surfactant. For example, increasing a may increase the hydrophobicity of the surfactant containing the siloxane unit(s) shown in structural formula (R). Increasing b may reduce the hydrophobicity of the surfactant containing the siloxane unit(s) shown in structural formula (R). There is a larger difference between the maximum and minimum contact angles, corresponding respectively to the un-actuated and actuated states, corresponding to stronger electrowetting actuation. The difference in voltage between the maximum and minimum contact angle values is smaller, corresponding to a lower electrowetting voltage. 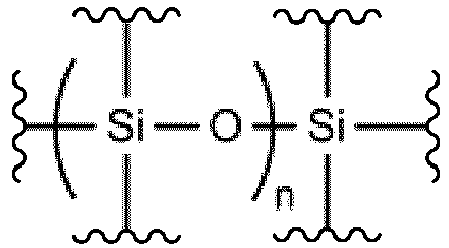 In embodiments described above, the siloxane surfactant may be soluble in the silicone oil. In some embodiments, the siloxane surfactant is water soluble; this may be achieved by increasing the wt. % of the hydrophilic portion of the surfactant. Such embodiments may still provide a low surface tension siloxane surfactant. In such embodiments, the surfactant may be incorporated into the aqueous droplet. This may make it possible to increase the speed at which the droplets can be moved. In some embodiments, the liquid droplet may contain the surfactant at a concentration ranging from about 0.001 to about 15% w/w. In other embodiments, the liquid droplet may contain the surfactant at a concentration ranging from about 0.001 to about 10% w/w. In other embodiments, the liquid droplet may contain the surfactant at a concentration ranging from about 0.001 to about 5% w/w. In embodiments described above, the oil utilized is a silicone oil. In some embodiments, the oil may be a hydrocarbon oil material with the siloxane surfactant dissolved in it. Such embodiments may retain the advantages of the above-described embodiments while also enabling a wider range of oils to be used, thereby increasing the flexibility of the device to perform a range of chemistries. Some examples of hydrocarbon oils that may be utilized as the oil material in which the siloxane surfactant is dissolved include octane, decane, dodecane, tetradecane, hexadecane, and xylene. In embodiments described above, the siloxane surfactant may be the only surfactant provided in the oil or liquid droplet. In some embodiments, one or more surfactants additional to the siloxane may be included in the oil and/or liquid droplet. The additional surfactants may be soluble in either the oil or the liquid droplet. In some embodiments where the siloxane surfactant is provided in the oil, the additional surfactant(s) may be provided in the liquid droplet. In embodiments where the siloxane surfactant is provided in the liquid droplet, the additional surfactant(s) may be provided in the oil. Exemplary additional surfactants may be block copolymers based on ethylene oxide and propylene oxide (Pluoronic®), polyethoxylated sorbitan esters (Tween®), Sorbitan esters (Span®), polyoxyethylene glycol alkyl ethers (Brij®) and such like. One example of an additional surfactant is a poly(ethylene glycol)-poly(propylene glycol)-poly(ethylene glycol) triblock polymer. The described embodiments may be used to provide an enhanced AM-EWOD device. In some embodiments, the AM-EWOD device may form a part of a lab-on-a-chip system. Such devices may be used in manipulating, reacting and sensing chemical, biochemical or physiological materials. Applications include healthcare diagnostic testing, material testing, chemical or biochemical material synthesis, proteomics, tools for research in life sciences and forensic science. The electrowetting on dielectric device of claim 1, wherein the surfactant is provided at a concentration ranging from about 0.001 to about 10% w/w in the liquid droplet or the filler fluid. The electrowetting on dielectric device of any one of claims 1 or 2, wherein the filler fluid comprises a silicone oil. The electrowetting on dielectric device of any one of claims 1-4, wherein the filler fluid comprises a hydrocarbon oil. The electrowetting on dielectric device of any one of claims 1-5, wherein the surfactant has no overall charge. The electrowetting on dielectric device of any one of claims 1-5, wherein the surfactant is anionic or cationic. The electrowetting on dielectric device of any one of claims 1-7, wherein the surfactant further comprises a polyol. The electrowetting on dielectric device of any one of claims 1-8, wherein the surfactant further comprises polyethylene glycol. The electrowetting on dielectric device of any one of claims 1-8, wherein the surfactant further comprises polyoxyethylene glycol (-(CH2CH2-O-)n) where n≥1, or wherein the surfactant further comprises polyoxypropylene glycol (-(CH2CHCH3-O-)n) where n≥1. The electrowetting on dielectric device of any one of claims 1-8, wherein the surfactant further comprises a hydrocarbon chain (CH2)n where n≥1. The electrowetting on dielectric device of any one of claims 1-12, wherein the filler fluid contains the surfactant, the surfactant soluble in the filler fluid, and optionally wherein the liquid droplet contains an additional surfactant. The electrowetting on dielectric device of any one of claims 1-12, wherein the liquid droplet contains the surfactant and the surfactant is soluble in the liquid droplet.